My father didn’t spend a lot of time talking about the hard times in the Depression. Sometime in the 1930’s he obtained the Village Gun — my name for the old Springfield 84-C .22 bolt gun. It was nearly new, with a Weaver straight tube 2 3/4 power 3/4 inch scope. He bought it for $7.50. That was a lot of money at the time. During the Depression, money was hard to come by. Wages for a boy picking rocks in farmer’s fields were 50 cents a day. As a man, my father was paid a dollar a day. He may have used those wages to buy the rifle. Growing up, I only heard a few hunting stories about the Village Gun. Most of the hunting stories involved my father’s Savage 99, chambered in the classic .300 Savage caliber. It was his favorite deer rifle. This is a story of deer hunting with the Village Gun. As an example, once, our family took a walk through a live oak woods in California. My father pointed out three deer a hundred yards away, among the trees. Myself, my wife and my mother strained to see the animals. He said “they are going to run any moment.” Thirty seconds later, we watched three deer bounding through the trees. I could see them once they started running. My father knew the land within a few miles of the farm far better than the proverbial “back of his hand.” I doubt he could tell you about every vein on the back of his hand. But he could tell you about the spruce grove in the hollow off the logging road, just past the big turn before you top the ridge. The country was different in Northern Wisconsin when he was a boy and young man. There were few big trees. Most of them had been cut during the logging boom from 1880 to 1920. This Wisconsin North Woods had supplied 80 percent of the worlds’ lumber in some of those years. The secondary growth was only a few years old. This story happened about 30 miles north of the farm. He was visiting his in-laws in country even wilder than where I grew up. It wasn’t deer hunting season. He had taken the Village Gun in the hopes of getting some meat in the early fall. He told his father-in-law that he was going to get a deer. Grandpa Gillis was skeptical. My father walked out the door and into the woods with the Village Gun. In the early afternoon he was carefully, slowly, and quietly slipping through the woods, rifle at a high ready, safety on and under his thumb. He was in cedars near a creek. The deer took off. My father wasn’t in a rush. He knew the deer was dead. Better to let it lie down and expire, instead of rushing forward and having it run further. After a minute, he moved forward a few yards, softly, softly. 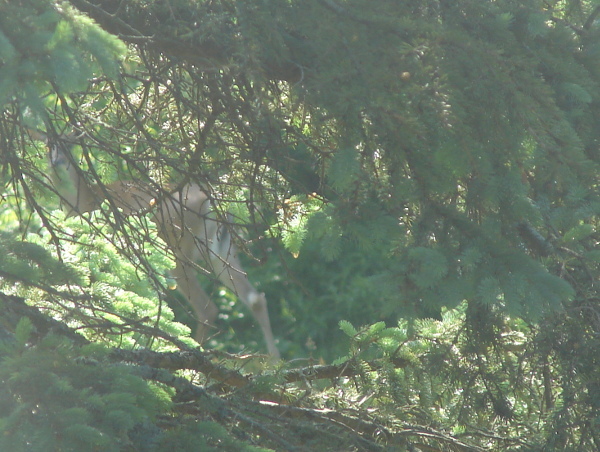 Suddenly there was the deer, peering right at him from 50 feet away. In the dense cover, he could only see the head. “How are you still on your feet?” he thought. He took another shot, carefully placed just below the line of the eyes, aimed to intersect a line connecting the two ear openings. A deer’s brain is not a large target. The deer dropped out of his sight. He continued forward, carefully, slowly, quietly. There was the deer looking at him again! He was sure that was a dead deer! It was a few yards away from where he had last shot it. Again, only the head was visible. The Village Gun came to his shoulder one last time. With the last shot to the brain, the deer dropped dead. My father was amazed at what had happened. Deer just didn’t act like that. That deer should have been dead three times! My father investigated. Maybe there was a branch or twig he had not seen, that had deflected a bullet or three. He looked at the deer he had just killed. It was a good shot, a bullet to the brain, a quick, instant, painless death. But there was only one hole, one shot, no entry wounds in the chest. He investigated further. Aha. A second deer, virtually identical to the first. Another single bullet to the brain. No chest wounds. More investigation revealed the third deer, the first he had shot, a good sized doe. No head wounds on this one. Only three tightly spaced shots through the lungs. It was an adult doe with two nearly adult offspring. I’m sure none of the meat was wasted. My father field dressed the deer and went back to tell his father in law to hitch up the horses. He had three deer to bring in. Grandpa Gillis did not believe him until he saw the deer on the ground. Shooting multiple animals in dense cover because of mistaken identity is not uncommon, if you spend a fair amount of time in the field. Roy Chapman Andrews had a similar experience to my father’s. Andrews was shooting Alaskan brown bears on Kodiak Island. The circumstances were similar. It was a female with two young that were almost ready to go out on there own. The famous explorer, spy, and museum curator shot brown bears with a 6.5×54 Mannlicher Schoenauer. Like the Village Gun, it was a five shot bolt action. Both men were excellent woodsmen. Both grew up in Wisconsin. Andrews was a generation older. I’m sure they would have enjoyed each others company. Maybe the Village Gun has a few more tales to tell. I will ask my brother if he recalls any. Great story Dean. We should tell the stories of our fathers, so that we are inspired by their their skills, brains and fortitude in difficulty. Good stuff Dean. A hunting buddy of mine just had a similar experience with three bobcats. I hear it is quite good! I went hunting this year during bow season. (Public land. I don’t have any private land to hunt). I think the deer are safer when I am in the woods then when I’m not! Hopefully someday I will spend enough time in the woods to become a halfway decent hunter. It is so addicting. You bring up a good point that might make for a good article: In a survival situation, how do you maximize the effectiveness of a sub-optimal caliber on game? That’s easy: head shots … as the story indicates. If you are hunting squirrels, rabbits, or woodchucks, head shots eliminate meat damage from a .22 LR bullet. If you are hunting medium game like deer, a head shot is the only guaranteed way to bring a deer down quickly. Note: brain shots on deer are harder than they seem because deer brains are rather tiny for their size. I have heard lots of stories of poor folks in rural areas using rifles chambered in .22 LR to put head shots on deer in order to keep their families fed. I have never heard of poor folks using rifles chambered in .22 LR to put lung shots on deer. I would be concerned that a .22 LR bullet does not penetrate enough to kill deer in any reasonable time with a lung shot. Would they die over the next several hours? Probably. And that is fine if they bed down right where you shot them. It isn’t so fine if they bed down a half mile away with no blood trail. My father said that a deer shot through the lungs with a .22 behaved just like one shot through the lungs with a .300 Savage. It ran a hundred yards or less and died. The trick is to shoot it through both lungs. That means you have to pick your shots carefully. It is easy for a .22 to penetrate both lungs on a deer with a broadside shot behind the shoulder. You do not shoot through the shoulder, or at very much of an angle. But behind the shoulder into the chest cavity is deadly and fairly quick. Abdominal cavity shots, (we called them gut shots) are to be avoided entirely. Deer shot in the abdominal cavity often travel for miles, no matter what they are shot with. A .22 LR does not have enough power to break the large bones on a deer, or to reliably reach vitals from quartering shots. You have to be very careful about picking your shots, which is where the woodscraft comes in. By the way, if I were in a survival situation, I would take a rifle in .22 LR over a bow every time. Okay, so I just thought of one exception: if I were trying to survive along a river that was loaded with salmon, I would prefer a bow over a rimfire rifle since the bow would enable me to bowfish efficiently. Otherwise, I would stick with the rifle. Didn’t this story get told just a few days ago? Is this Groundhog Day? Same picture, same gun, different story. Yeah. Guess which putz didn’t read the story til he made a comment. My dad was a true country boy from back up in bloody Mingo county. Like your dad he could feed a family with a .22 and the laws weren’t always followed to the letter. Seasons only matter when your family is fed. I have really enjoyed your stories about your father Dean. Thank you for sharing. My father was an avid outdoorsman. I watched him pull a creel full of trout out a stream nobody caught anything in and come out of a strand of woods with an eight point that had just been driven to no avail by others. It pains me to see how many young kids and men have no interest spending time hunting or fishing. If it isn’t phone or computer related, you can count them out. The outdoors isn’t for everyone, I understand that fully. Not everyone grows up with access to hunting and fishing areas around them. But it is the survival element to the outdoor sports that that I think is overlooked by so many. To be self reliant if something were to go wrong. That is a great story, it is amazing the stories some of the “mundane” guns we have could tell. My father was not interested in teaching me about his guns when I was a child. But I introduced my daughter to guns. She had a great time with the rented 22 caliber pistol. Latter she shot my hand and long guns. She is hooked now! My father was born and raised in the backwoods of Pennsylvania, deep in the Allegheny National Forest, where most people hunt, and the deer run through tightly packed trees that are hard for a human to squeeze through. He was born just after the the market crash of 1927, and I am sure most of the town hunted for sustenance. His family fell on hard times when his father was crippled in a logging yard accident. But if he ever went hunting, I never heard a word of it. Wonderful story. Also my Dad and his Dad used to hunt in Abruzzo, central Italy immediately after the war. They used a shotgun and the 91 Carcano I proudly own now. They really had some tales to tell. Overnight in the mountains with old WWII military outdoor gear. I daydreamed when they told me about it. I’d love to hunt too, but nowadays it is very difficult here. “Look for parts of a deer.” Good advice. So many times it’s that “flicker,” be it an ear or a tail, that gets my attention as i scan the woods. I amaze myself sometimes at how in the hell i can pick one out, but it comes after years of practice staring in the woods. I tell my son-in-law to look “through” the woods, hear the sounds “under” the sounds. There’s a rhythm to the woods, and it ebbs and flows like water as creatures move through it. Of course, make sure you see the whole deer, and are sure it actually is a deer, before you let fly!